Easton	Overall rating:	5	out of 5 based on 10	reviews. Our Easton personal injury lawyers at the Trapani Law Firm handle all types of car accident, personal injury and wrongful death lawsuits in Easton PA, Forks Township PA, Palmer Township PA, Nazareth PA, Wilson PA and Northampton County or Lehigh County Pennsylvania. With a convenient satellite office located in Easton PA, our Easton car accident lawyers can be reached at any time. If you have suffered a serious personal injury, we are happy to meet you in Easton at your home, or at the Easton Hospital in Wilson PA. Please contact an Easton car accident lawyer at The Trapani Law Firm for a free consultation. We’d like to help support our local Easton PA community. If you need an Easton medical malpractice lawyer or Easton birth injury lawyer we are happy to meet you at any Easton hospital. The high number of tractor-trailer semi trucks on Highway I-78 and Route 22 create a dangerous situation for all Easton motorists. If you’ve been injured due to a negligent trucker or motorist in a tractor-trailer truck accident or auto accident, call the Easton injury lawyers at the Trapani Law Firm today for a free consultation. Our Easton car accident attorneys have represented injured Plaintiffs in a wide range of motor vehicle accidents in Easton and the entire state of Pennsylvania. Including: car accidents, motorcycle accidents, pedestrian accidents, tractor-trailer truck accidents, car crash lawsuits and wrongful death litigation. Our Easton accident attorneys will help relieve your stress and allow you to focus on your recovery and your family. We represent clients injured in Easton truck accidents involving delivery trucks such as UPS trucks, FedEx trucks, DHL trucks, U-Haul trucks, Semi trucks and Cintas trucks. Founded by Attorney Matthew Trapani, our law firm has built a reputation as being a champion for those seriously injured in Easton PA due to the negligence of others. The goal of an Easton personal injury lawsuit is not to just get you medical bills and other out of pocket expenses compensated, but to fully compensate you for the Easton personal injury you suffered. You may also be entitled to recover for non-economic damages after an Easton car accident. The most common non-economic damages in an Easton personal injury lawsuit is pain and suffering. During a free consultation, an experienced Easton personal injury lawyer will ask you questions to help determine which types of damages you should be compensated for after an Easton accident. Including: Lost Income, Pain and Suffering, Medical Bills and Property Damages. Please call a personal injury lawyer in Easton Pa anytime for a free consultation. Our practice areas include the following personal injury lawsuits: brain and spinal cord injury, birth injury, wrongful death, medical malpractice, premises liability, construction and workplace injury, product liability and civil rights. No matter the type of Easton personal injury, we can help. If you’ve suffered a traumatic brain injury in the Easton area, call an experienced Easton TBI lawyer anytime for a free consultation. Our firm’s philosophy is to aggressively and tirelessly represent the seriously injured and their families – just compensation is the only acceptable outcome. Our Easton car accident lawyers have a strong reputation with the local insurance adjusters as a law firm that will only accept fair compensation for our clients’ personal injury. Our Easton personal injury lawyers would like to help. The Trapani Law Firm are your personal injury lawyers in Easton PA. When you have been injured in an Easton car accident due to another person’s negligence, you need an Easton personal injury lawyer who cares about your recovery, including physical, mental and financial. You can rely on our Easton personal injury attorneys to walk you through the legal process and make sure your best interests are fully represented. Our Easton injury attorneys know this is a stressful time in your life. Let our accident lawyers handle fighting the insurance companies and negotiating just compensation. Our experience handling Easton personal injury lawsuits like yours allows our lawyers to anticipate the next step and keep you well informed throughout the legal process. Our Easton personal injury lawyers work on a contingency fee basis, meaning we only get paid if and when you are financially compensated. Your initial consultation with us is completely free of charge. Our Easton truck accident attorneys are here to help keep our local highways safe for the entire community. 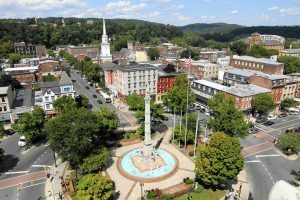 Call us anytime day or night to speak with a personal injury lawyer in Easton PA.
Attorney Trapani was born and raised in Easton Pa. He takes great pride in representing his local Easton community. Attorney Trapani’s knowledge of the local Easton roadways and businesses is an asset in every Easton car accident lawsuit. Our Easton personal injury lawyers take pride in giving back to the local community by patronizing local businesses such as the Easton Bakery, the Easton Mall, the Easton Express and many local Easton Pa restaurants. Our law firm’s Easton Pa zip code is 18042, located near the Easton circle. Our personal injury law firm is very familiar with Easton Hospital, as many of our clients are treated there. Additionally, attorney Trapani enjoys helping out with youth athletics within the Easton School District. Specifically, taking the time to speak with the Easton High School Football team each year. If you’re looking for an Easton injury lawyer near me, call our personal injury attorneys today. We take great care of our local Easton community. Easton car accident matters can be very complex, but we answer your questions in plain English, not “legalese.” With that in mind, we make sure you understand exactly what is happening and why, every step of the way. Don’t worry, we speak your language. Our Easton personal injury lawyers take great pride in always getting back to our clients in a timely manner. Our injury accident lawyers are happy to meet you at Easton Hospital 250 S. 21st St., Easton, PA 18042. Our Easton wrongful death lawyers are always here to help. When someone is killed in an accident caused by the negligence of another person, his/her family members can bring a Northampton County wrongful death lawsuit. Easton wrongful death lawsuits may also be filed when the loved one’s death was caused by criminal conduct such as drunk or reckless driving. Let an experienced Easton wrongful death attorney help your family recover and get back on their feet. Our wrongful death lawyers in Easton PA offer free consultations. If you believe that a person or company is liable for the Easton wrongful death of your loved one, please contact the Easton wrongful death lawyers at the Trapani Law Firm, to schedule a free consultation. We represent wrongful death clients in Easton PA and across the state of Pennsylvania to try and ensure justice for anyone who has been wrongfully injured. Our Easton medical malpractice lawyers represent elderly victims of nursing home abuse in Easton PA. Additionally, our fatal accident lawyers handle wrongful death lawsuits in Northampton and Lehigh County. Please call our Easton wrongful death attorneys today. We’d like to help insure justice for your family. An experienced Easton wrongful death attorney at the Trapani Law Firm is available to meet with your family after any fatal Lehigh Valley accident. Please do not hesitate to call for a free wrongful death consultation. Hiring a personal injury lawyer with an exceptional standing in Easton PA is very important when trying to find a personal injury attorney Easton PA. You will want to find a personal injury attorney that is dedicated to working specifically on personal injury lawsuits. Attorney Trapani has devoted his career to helping Easton PA families who have been injured in personal injury accidents. We suggest you evaluate each potential personal injury lawyers website to see which types of legal cases he or she handles most. The best personal injury lawyers will have a proven track record of success and integrity within their local community. Then, search for your Easton personal injury lawyer on Google and ask yourself: Are you satisfied with the potential personal injury attorney’s online reviews? We recommend that you read all of the personal injury lawyer’s online reviews, including any negative reviews, to gauge a personal injury attorney’s character, reputation and standing in Easton PA. The top personal injury attorneys will work with a team of medical experts, car accident reconstructionist engineers and financial experts to ensure the highest compensation available for your personal injuries. Easton Pennsylvania has two main courthouses. The Northampton County Court of Common Pleas is located at 669 Washington St, Easton, PA 18042. Additionally, the U.S. District Court of the Eastern District of Pennsylvania is located at 101 Larry Holmes Drive #400, Easton, PA 18042. An Easton personal injury lawsuit can be brought in either location depending on the facts and circumstances surrounding the Easton PA personal injury accident. Our Easton personal injury lawyers are prepared to bring a personal injury lawsuit in the Northampton County Court of Common Pleas of the U.S. District Court of the Eastern District of Pennsylvania. On our staff, we have an experienced Easton motorcycle accident lawyer and an Easton birth injury attorney ready to provide you with a free consultation at anytime. An experienced Easton medical malpractice attorney is here to help after experiencing medical negligence at an Easton Hospital. Sadly, close to 500,000 Americans suffer their wrongful death each year as a result of medical malpractice. Our Easton medical malpractice lawyers handle cases involving amputations, Easton birth injury, TBI, spinal cord injury and wrongful death. It is the responsibility of our doctors, hospitals and nurses to provide all patients with a high standard of care. When medical professionals and hospital staff fail to deliver proper medical treatment it is usually a matter of medical malpractice or medical negligence. If you have suffered an Easton personal injury as a result of medical negligence, call an experienced Easton medical malpractice lawyer today. We offer free medical malpractice consultations and are happy to meet you at your home. Far too many childbirth injuries occur in the United States on a yearly basis. These birth injuries frequently leave the child with a lifelong disability. Devastating results such as cerebral palsy, nerve damage, brain damage, stunted growth, or death can occur. An experienced Easton birth injury lawyer at the Trapani Law Firm can help you and your family. Call us anytime for a free Easton birth injury consultation. Many of these birth injuries are often caused by preventable medical malpractice. When hospital nurses and doctors commit medical malpractice during the labor and the childbirth process, the effects can be catastrophic for the child and your family. Call an experienced Easton birth injury attorney anytime for a free consultation. When you’ve been in an Uber car accident or Lyft accident, it is important that you understand your legal rights. Our Uber accident lawyers in Easton PA and the Lehigh Valley can help you handle your Uber or Lyft auto accident to ensure that you receive just compensation for your personal injuries. Uber and Lyft passengers are entitled to up to $1 million in underinsured and uninsured motorist insurance coverage. This means that as an Uber/Lyft passenger you can receive up to $1 million dollars for any personal injuries suffered in an Easton Uber accident, no matter who caused the Easton car accident. Our Easton Uber accident lawyers have handled hundreds of car accident personal injury lawsuits. After an Uber accident, you should seek immediate medical attention, than call an experienced Lyft and Uber accident attorney in Easton. Our Uber accident lawyers offer free consultations. Call us anytime; we’re here to help. An experienced Easton personal injury lawyer at the Trapani Law Firm is happy to meet you at 120 N. 3rd St., Easton, PA 18042 for a free injury consultation. Our injury attorneys handle the following types of personal injury lawsuits: car accident cases, medical malpractice, wrongful death lawsuits, truck accident litigation. brain injury lawsuits, baby powder ovarian cancer cases, birth injury cases, motorcycle accident litigation, roundup cancer lawsuits, Incretin and Januvia lawsuits, breast implant ALCL lawsuits, cerebral palsy lawsuits, Xarelto cases, Mesothelioma Asbestos Cancer lawsuits, workplace injury litigation, Uber accidents, bus accident litigation, drowning accident cases, Invokana lawsuits, IVC filter litigation, Zofran lawsuits, construction accident litigation, gas explosion cases, burn injury lawsuits and E-cigarette explosion lawsuits. Call us anytime for a free injury consultation. Our Phillipsburg personal injury lawyers are happy to travel to make home visits or hospital visits to Phillipsburg NJ, St. Luke’s Warren Campus at 185 Roseberry St. Phillipsburg NJ 08865 Warren Hospital at 755 Memorial Pkwy, Pburg NJ 08865, Warren County, NJ, Easton Hospital at 250 S. 21st St. Easton Pa. St. Luke’s Health Center Downtown Easton at 414 Northampton St. Bangor PA, Pen Argyle PA and Bath PA. Our car accident lawyers support the annual Easton – Phillipsburg football rivalry. In addition to the Forks Township Falcons and Palmer Township Panther youth athletic leagues. Throughout the years, our Easton personal injury attorneys have successfully represented individuals and families in Easton PA who suffered injury by the negligence of others and we understand how damaging it can be to deal with mounting costs and distress caused by serious personal injury. Our Easton injury lawyers retain the very best experts including accident reconstructionists, medical doctors, forensic pathologists and other experts because every Easton personal injury lawsuit requires the plaintiff to prove both liability and damages. Our Easton car accident lawyers will document and preserve any evidence necessary to prove your case and thoroughly prepare your lawsuit for a jury trial, while also exploring the opportunity of a fair settlement. Call an Easton car accident lawyer at the Trapani Law Firm today to set up your free consultation: (610) 351 – 2330 or contact us. We can help.